A person who is interested in fly fishing guide jobs must enjoy being out of doors, as well as meeting new people. It's also important to love fishing and be enthusiastic about sharing what you know with others. A fly fishing guide must be knowledgeable about where the best local fishing spots are so that he or she can relay this information to guests at a resort, hotel, campground or to private clients. In some cases, the guide provides instruction to people who are either new to fly fishing or who want to develop their technique in the sport. The guide may also be expected to teach basic fishing skills to children, as well as do fly tying in between sessions. The job will include guiding trips to various fishing spots. The guide is responsible for the safety of the participants, and he or she should have First Aid and CPR training. For resort work, the fly fishing guide must have a clean driving record. The fishing guide will also need to comply with local requirements for fishing and boat operating licenses. 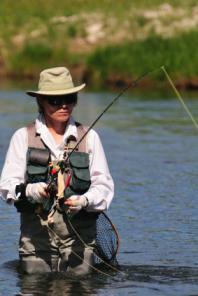 The Sweetwater Travel Company in Montana offer a one-week fly fishing guide training program. The fee for the program for 2010 is $2,100, which includes meals and lodging. Students must bring their own fishing gear and have a valid Montana fishing license before starting the course. Hubbard's Guide Academy is another Montana-based company offering fly fishing guide training. Students who choose this program find out what the daily life of a guide working at a resort is like. They stay at a lodge and eat with employees. The curriculum includes fishing and boating techniques, safety and business strategies. The school offers a job placement service to graduates. As of the summer of 2010, the course fee is $1,900. People who are interested in working as fly fishing guides can work in a variety of settings. Hotels and resorts may hire guides for their peak season, or the fly fishing guide may be able to get clients by leaving their name and contact information with the front desk at these places that cater to tourists. Dude ranches are another type of employer that hires people for fly fishing guide jobs. Employment is usually available from May to the end of August. Workers live on the premises, and the employer usually provides dormitory-style accommodations. Meals are eaten with the rest of the staff. During off hours, employees are expected to participate in guest activities being put on at the dude ranch. A person who is interested in working on a dude ranch as a fly fishing guide must be enthusiastic and as patient with answering guest questions at the end of the day as they were at the beginning. The guides receive hourly pay, as well as overtime pay. Meals and accommodation are provided by the employer, and those people who work the entire season are paid a bonus. Retail shops that cater to people who enjoy fly fishing can help a guide find private clients. The manager may let the guide leave business cards or brochures in the shop or provide referrals to prospective clients. Fly fishing guide jobs can provide a good seasonal income for people who enjoy being out of doors and like meeting a variety of people. If you live in an area where fly fishing is popular, you may want to consider this career choice.